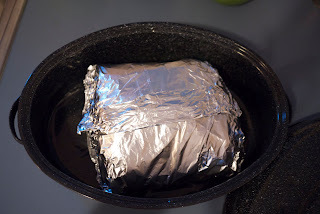 Place roast in the middle of a large sheet of aluminum foil. Then rub roast with salt and pepper. Cut 7-8 slits in the roast and fill each with about 1/2 tsp of the minced garlic. Drizzle the worchestershire over roast. Sprinkle the lipton soup seasoning and spread the mushroom soup over the roast. Wrap fairly tightly in the foil, then double wrap it. Be sure it is well sealed. Bake on low (240 F) for 11-12 hours. (my oven is conventional, so it cooks even lower at 215 F.) Carefully open foil, shred beef and save all liquid. This roast always turns out really tender and delicious. The drippings make a great gravy when strained, and we use the leftovers to make shredded beef enchiladas.